Although the computer was still functional, it was determined that it was too old to leave in service. therefore the latest computer upgrade was installed. 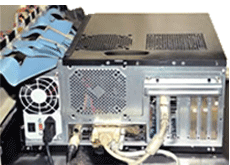 Click here to see side-by-side images of the parts before and after remanufacturing.